The American River earned it's spot in history on January 24, 1848; when James Marshall discovered gold on the South Fork marking the start of the Gold Rush. Later this river also became deemed the best rafting hotspot in the state. Thousands of tourists every year come out to enjoy the spectacular views of canyons, rock cliffs, raging waters, and historical parks. Experiance the heart pumping rapids of the American such as Meatgrinder, Triple Threat, Racehorse Bend, Trouble Maker, Fowler's Rock, Satan's Cesspool, Bouncing Rock, and Hospital Bar to name a few. American River rafting trips start when the Sierra snow caps begin to melt, releasing waterflow & blanketing the foothills with rainbows of flowers. You won't want to miss a one-of-a-kind, breath-taking trip down the historical river! Placerville KOA has partnered with American River Recreation bringing our campers the most experienced, fun packed trips on the river today! American River Recreation's world-class reputation stems from 31 years in business by the same owner, the best rafting equipment available, top safety standards, and unforgettable experiences! Whether you are first timers or seasoned rafting veterans, American River Recreation has a trip ready for you! Over the summer, whitewater rafting on the American River is really something you don't want your family or group to miss out on. In the past our campers have overlooked rafting as they feared it required too much preparation and planning. This is when American River Recreation became the best choice for our campers needs. Being in business on the American for so many years, they are meticulous about planning their trips in a way that really makes it hassle free and enjoyable! You'll want to see your American River Recreation trip information packet for details in what to bring, but for most trips you'll only need your swimsuit, sunscreen, sunglasses, shorts, hat, old tennis shoes, and a pair of dry clothes for your return. You also won't want to forget a waterproof camera so you can share your pictures with us back at the camp! 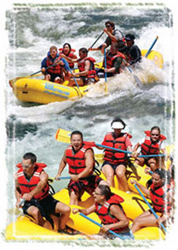 American River Recreation offers such a wide variety of river trips that makes rafting on the American fun for everybody in the party. There is alot more to rafting then just the views and thrills, there is also a great deal of team building that takes place which really helps build relationships between groups and families. Whether your taking your 7 year old on their first trip down the American or your a large group looking for thrills... you will walk away from American River Recreations whitewater rafting trip with stories for years to come! Click here to view a few of our favorite trip selections from American River Recreation! This 7.5 mile American River white water rafting voyage will have you enjoying the outdoors amongst the beauty and history of the gold country. Trip begins at 10am with some paddling practice to get confortable and safety talks to prepare for your journey. Once launched, within the first half-mile the excitement begins! Tension builds as you hear the raging waters of Meat-grinder, Triple Threat, Racehorse Bend and Trouble Maker which are just a few of the rapids you encounter along the way. Approximately two hours after launching, a delicious deli-style lunch buffet is served at historic Coloma State Park. Once you have eaten, the fun continues at a more leisurely pace. Although you bounce down several more good rapids, you have more of a chance to relax and enjoy the scenery as the American River winds its way to Coloma, where the journey will end at approximately 3:00 p.m. This California river rafting trip takes you through 14 miles of scenic countryside where you will travel through a spectacular canyon of rock cliffs and thundering American River rafting waters. Trip begins with a short bus ride to our launching point, listening to safety talk, as well as paddling instructions. Here, you will meet your guides and receive your lifejacket. Once on the water, you have a few minutes to practice your paddling skills so that everyone feels comfortable before beginning the adventure. We serve a delicious deli style lunch buffet at our campground. Once you have eaten, the rafting adventure continues highlighted by spectacular scenery and some of the most exciting rapids; Fowler?s Rock, Satan?s Cesspool, Bouncing Rock, and Hospital Bar, to name a few. Our 14-mile-long journey ends at Folsom Lake. Relax and swap stories on the scenic bus ride back to your cars, where we arrive at approximately 4:30 p.m.
We offer two different half-day California river rafting trips: one in the morning down the Chili Bar section, and one in the afternoon through the Gorge. Both these trips offer a great introduction to California river rafting and perfect for those desiring a shorter day without meals. This easy, four mile, class II trip is great for families wanting to bring along the little ones. Children as young as four years old are welcome on this American River white water rafting adventure. After a short bus ride to our launching point, we begin with a safety talk and paddling instructions. Here, you meet your guides and receive your lifejackets. Once on the water, you have a few minutes to practice your paddling skills so that everyone feels comfortable before beginning the adventure. This is a leisurely float trip with plenty of time to take in the beautiful scenery and wildlife. While on the river you will encounter some great Class I & II rapids such as Lotus Ledge, Barking Dog, and Current Divide. The river trip ends approximately 12:00 p.m.